Please join us at the USC Caruso Center on Saturday, October 6, 2018, where Nativity will host a truly extraordinary event benefiting the children of Nativity School in South Los Angeles. 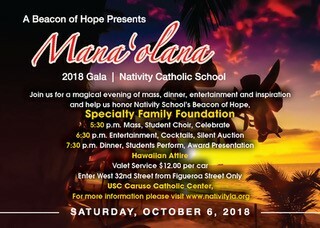 I am referring to Nativity’s 7th Annual Beacon of Hope Inspiration Gala, Mana’olana, meaning hope, honoring Specialty Family Foundation for their years of dedication to inner-city Catholic schools. Specialty Family Foundation’s largest programmatic emphasis and most hands-on area is their focus on Archdiocese of Los Angeles inner-city Catholic schools. They provide opportunities for these schools to dramatically enhance and grow their capacities in marketing, developing and academic resources in sophisticated, effective and sustainable ways. Specialy Family Foundation our Beacons of Hope! Our only fundraising event of the year, proceeds from the Beacon of Hope gala will directly support our school’s academic and leadership programs which successfully develop the talents, character and intellectual potential of hundreds of at-risk students in our South Los Angeles community, providing them an educational solution out of poverty. Become a Beacon of Hope for Nativity by being an event sponsor or purchasing an ad in the Program/Tribute Book.